Agri-food exports continue to be essential to the European Union’s (EU’s) economy, showcasing a model that China would do well to learn from. Bringing this experience from Europe to China, small and medium-sized enterprises (SMEs) can leverage their expertise to take advantage of recent advances in China’s agricultural sector; however, there are still challenges that businesses must be aware of. To help smooth the way for European businesses, in this article, Rafael Jimenez and Vivian Chen from the EU SME Centre provide advice on how to navigate this new and challenging marketplace. 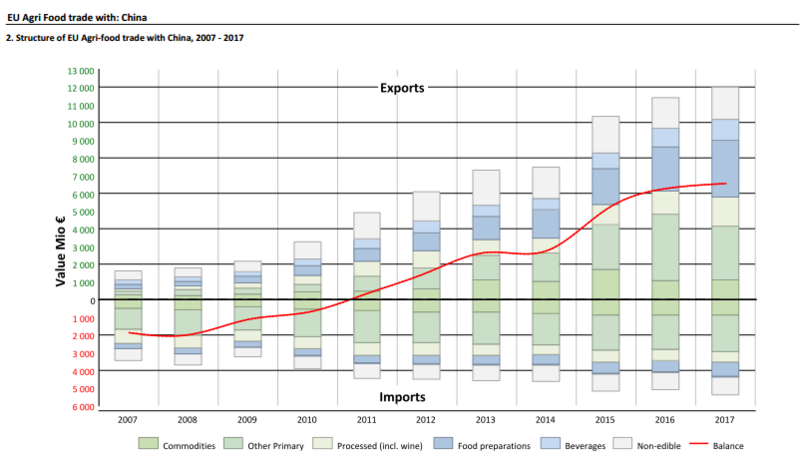 Agri-food is one of the dominant areas the EU maintains a trade surplus with China in, highlighting the fact that the quality of EU agri-food products is well recognised in China and that demand continues to grow. 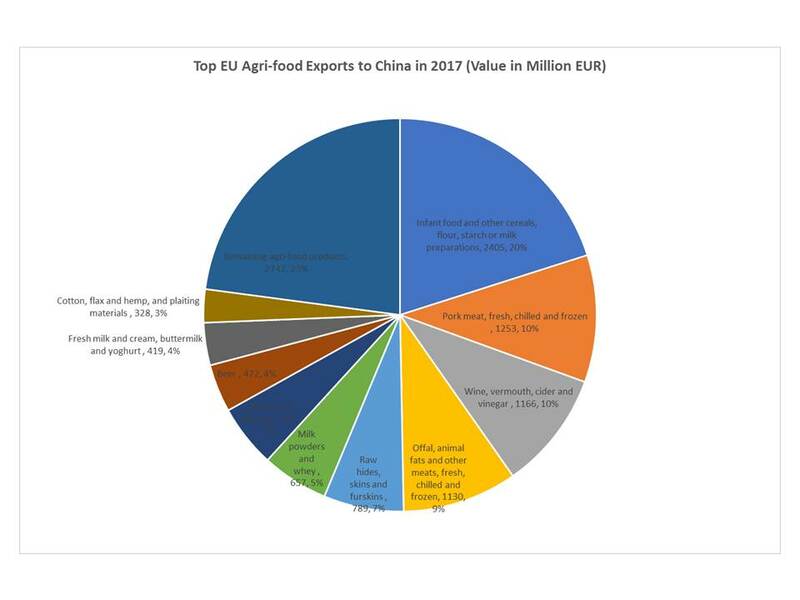 The importance of China for EU’s agri-food businesses is obvious, with the EU investing a considerable amount of resources to ensure its businesses stay competitive in the Chinese market and that the trade environment is conducive to European business operations. In May 2018, Phil Hogan, commissioner of the Directorate-general for Agriculture and Rural Development of the European Commission, led a delegation of European companies to SIAL China 2018 in Shanghai, Asia's largest food innovation exhibition, to connect with those operating in the Chinese market. Achieving success in a market as large as China is never easy, especially for small businesses. Market access barriers remain as one of the largest challenges for European SMEs. They find it time-consuming to complete administrative processes in China in order to sell their products. The recent reshuffling of administrative bodies in the Chinese Government further increases businesses’ concerns of delay. However, the EU and the Chinese Government have been carrying out negotiations to put in place protocols for certain categories of agri-food to facilitate trade between the two powers. The Chinese authorities’ regulations on food and beverage products in the domestic market have recently been strengthened, with its new Food Safety Law that was enacted in 2015. The law aims to clean up China's entire food supply chain – from banning toxic pesticides, regulating labelling, distribution, and most importantly, increasing punishments for those who violate existing laws. It is important for every company in this business to understand what the specific requirements are and how to be compliant. Another common challenge for exporters is finding the right business partner in China to help build effective distribution channels. In particular, reaching out to markets outside of first-tier cities demand a deeper level of knowledge and experience. Consumers in China’s regional cities might have different shopping preferences, which would require brands to craft a customised strategy. For European agri-food exporters looking to sell internationally, the Chinese market cannot be ignored. In addition to the product types already high on the exporting list, the EU SME Centre foresees food technology and chemical compounds for the domestic food industry (such as flavours and compounds to reduce cholesterol) to be on the rise. We would encourage Chinese businesses to take a deeper look at what the EU has to offer in food-related technologies. Though the technological side of food and beverages is often neglected, the EU has much to offer. For example, traceability is a critical issue and the cornerstone of the EU’s Food Law. To address this issue, the EU utilises the Internet of things to trace food and beverages along with ensuring water and soil quality. This is an area where china can learn a lot from the EU’s experiences. Opportunities also lie with the auxiliary industries related to the food and beverage sector. This can include anything from bottling, packaging and sanitising food procedures to research services. For example, China remains in the early stage of processing seafood products, and the EU has more advanced know-how in terms of safely prepared, pre-cooked, and ready-to-eat food. Additionally, cross-border e-commerce is seen as a growing trade model that European SMEs should familiarise themselves with. In the long term, the EU SME Centre would like to this new model enter mainstream and become used nationwide, rather than in select pilot zones. Opportunities in the agri-food sector are abundant in China and a preliminary analysis of 2017 trade data suggests this trend remains strong1. China’s climate, geography, water scarcity and arable land issues, along with an increasing number of discerning consumers, point to an expansion of the agri-food sector. Though cautious, the EU SME Centre remain positive regarding the agri-food sector, and it encourages SMEs to keep their knowledge of the Chinese market up-to-date. Our team of experts provides advice and support in four areas: business development, law, standards and conformity and human resources. Collaborating with external experts worldwide, the centre converts valuable knowledge and experience into practical business tools and services easily accessible online. From first-line advice to in-depth technical solutions, we offer services through Knowledge Centre, Advice Centre, Training Centre, SME Advocacy Platform and Hot-Desks. The centre is funded by the EU and implemented by a consortium of six partners – the China-Britain Business Council, the Benelux Chamber of Commerce, the China- Italy Chamber of Commerce, the French Chamber of Commerce in China, the EUROCHAMBRES, and the European Union Chamber of Commerce in China. To learn more about the centre, visit the website www.eusmecentre.org.cn .